This year’s British Masters saw us look to build on the success of last year, with more crews entered than last time around. In a much stronger event, we still managed three Silver Medals with others just missing out – in one case by three hundredths of a second! Despite not bringing home a Gold, the increased competition meant that the Silvers were actually harder earned, racing against some long established and larger clubs. Especially encouraging was the sheer number of competitors we put out, including a couple of Novice boats. Sadly, from a personal point of view, an injury to my doubles partner Steve meant we had to scratch, so no racing for me at this year’s event. A straight final against Lea and Furnivall saw Iain swap in for Chris from the previous day’s Nottingham City Regatta novice boat, as Charlene take over coxing duty from me. With the other two crews getting a very quick start, our guys were dropped back fairly rapidly. Although they were able to close the gap slightly over the second half of the race, they weren’t able to make up the deficit and finished a couple of lengths down on the winners, Lea. With limited practice and still hampered by slow starts, it was still a good first time out race performance by this crew. We had not one but two ladies representing us in this category. First out was Amelia, in her first singles race for a long time. Despite this, she still managed to hold off two boats to finish fourth in her heat, sadly missing the final as the first three qualified. Next up was Helen M, racing at the Masters for the first time. Blasting out of the start, she rapidly pulled into a length’s lead over her nearest competitor and was able to control the race from the front. This saw her win the heat reasonably comfortably and put her through to the final. Having a heat of the double with Jenny before the single final didn’t help and despite another fast start that saw her fourth at the halfway stage and really in contention, Helen faded over the second half to finish last. Still, it was good learning for next year and a commendable sixth overall in a very big field. A strangely out of sorts row from Helen M and Jenny saw them place fourth in their heat, failing to make the final. Not helped by being hit by a big wash halfway down the course, they were a good few lengths off of the leading pack. This was very much an experimental crew, with Amelia hopping out of the single and Jenny out of the double to join Yemin and Becks in a “B” quad. Another straight final saw them racing some very strong opposition, with Leicester, Bristol, MAA, Ross and local rivals Star in the mix. The race fairly quickly split into three, with Leicester and Bristol contesting the lead, MAA and Ross slugging it out for third and our ladies and Star battling for local pride. With just half a second between MK and Star at half way, it was a real case of digging deep and holding on, needing to cover every move that Star made. Despite a really big push into the red buoys, our crew has just enough to hang on to take a hard earned fifth place. Clearly lots of potential here, with only a few outings to date under their belts! Having won Silver in a double at last year’s Masters, Benn and Tim thought they’d try their luck in a pair this time around. This again proved their versatility as, for a second year running, they claimed Silver. In a straight final with York and Worcester, they edged ahead of Worcester over the first half of the race, with York pulling ahead of them. The second half saw Benn and Tim push on and extend their lead but weren’t able to close in on York, but still more than enough for a (relatively) comfortable second place. Although there were only three boats racing, one crew had scratched, so they did qualify for their medals. Unfortunately, they didn’t realise this at the time and so didn’t get the pleasure of rowing over to the victory pontoon to collect them. This was the first of what turned out to be many close fought races for the club. A tough looking final saw Liz, Andi, Lindy and Helen J (with me coxing) line up against a pair of Nottingham boats, and one each from Abingdon, Wallingford and Peterborough. Although they’d had a good training session on the Trent in the morning, as a crew they were still short of race and, critically, start practice. From the “go”, we dropped about a length on virtually all the other crews (one of the Nottingham boats just flew out into the lead) and we were then left trying to claw it back. Trailing last at the halfway point, the girls gradually reeled in Peterborough to inch in front. The next target was Wallingford and we closed on and then passed them, gaining inexorably on Abingdon and the second Nottingham crew. Unfortunately, as we were gaining on Abingdon for third (and bronze medal position) we simply ran out of lake, finishing just 1.2 seconds behind. Still with a poor start and just 2.3 seconds covering 3rd to 6th, a very fine performance indeed in a very hard fought race. Considering that three of this crew hadn’t even sat in a rowing boat until last August, this was yet another brilliant performance. For the crew as a whole, it was also their first race together, with Maria stroking, followed by Helen C, Kelly and Winnie with Karen coxing. Another straight final saw Worcester race into an early lead but Milton Keynes got away well and were fighting it out with Oundle Town at the halfway stage. Lack of race practice then affected the ladies as they fell away from Oundle and Warwick rowed past them in the closing stages. Still, they placed fourth, well clear of Dart Totnes and Loughborough and under a length off third and what would have been a well deserved Bronze medal. 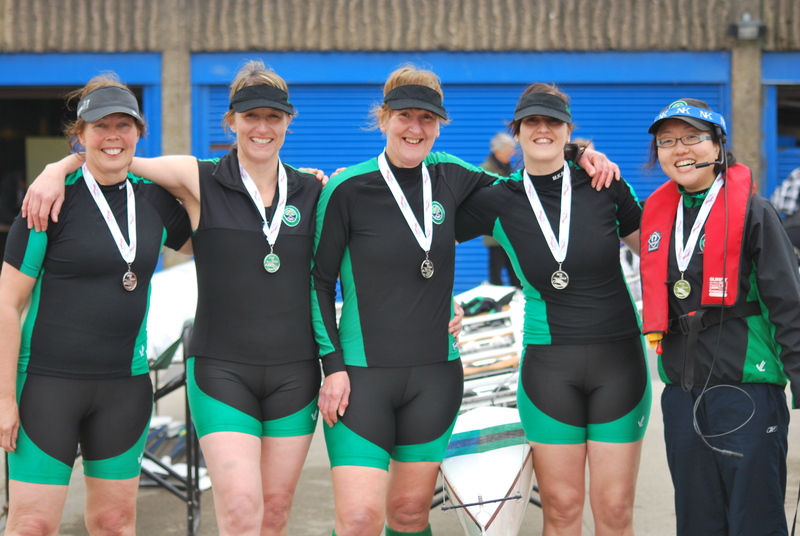 Next out were the “C” ladies four, with a strong looking line up of Helen J, Paula, Karen and Lou with Yemin in the cox’s seat. Lined up against them in the final were York, Stourport, Furnivall, Llandaff and Hereford. In last year’s event, Hereford had pipped Tees to the Gold Medal, so our ladies were keen to see how they measured up this year. From the off, York, Hereford and MK pulled away from the other crews and got into a hard three-way battle, with Furnivall trying to hold on to them in fourth but the others drifting away. This was to be another momentous fight, with under a second separating the three leading crews at halfway, York in first, then Hereford with MK just behind. Over the next 500m, our ladies chipped into Hereford’s lead, gradually inching past them, entering the red buoys maybe a quarter of a length up on Hereford and half a length down on York. Despite throwing everything at it, they couldn’t quite pick off York but had the immense satisfaction of beating last year’s winners to take second place and Silver medal. A really hard earned medal from a simply stunning performance, in doubt right up to the line, missing Gold by just 2.6 seconds. Following on from one close finish, Liz and Andi then delivered an even closer one. In yet another straight final, they were drawn against Norwich, Nottingham, Bristol, Abingdon and Exeter. The race split into two fairly quickly with our girls in the leading pack with Norwich, Abingdon and Nottingham, crossing halfway in that order with a mere 2.4 seconds covering the four crews. From halfway, Norwich and MK started piling on the pressure and pulled clear of the other two boats, opening up clear water to Abingdon but with nothing between them. Absolutely hammering for the line, both crews gave it absolutely everything, with a “beep-beep” finish needing it to “go upstairs” for a photo finish review. After an agonising wait, the verdict went to Norwich, with a lead of 0.14 seconds! Despite missing the Gold by the tiniest fraction, Liz and Andi were delighted with their Silver medals. Yet another wonderful performance by the pair of them. Having watched Liz and Andi coming so close, we honestly didn’t think racing could get any closer. Wrong. The Ladies “C” eight had a very strong look about it and were aiming to take forward their hugely impressive showing on the Tideway (with a couple of the “kids” making way for “more experienced” ladies). This was going to be a four way fight, with club crews from York and Nottingham as well as a multi-composite boat that seems to have people from all over the Eastern and Central regions. Obviously a put together crew to enter as strong a boat as possible, our ladies felt this was going to be a tough race. Nottingham got off to a flier and eased into a length’s lead, with the composite boat and ours locked side by side and York following, slightly down. By halfway, Nottingham were holding the lead with MK and the composite crew sharing an identical time. A really strong push eased our boat into second but the others came back at them. To the line we could see the composite gaining and looking to be finishing the stronger – this time there was no “beep-beep” though. The two crews were so close, there was a single “beep” with neither crew being sure who’d taken second and with it Silver. After what seemed an eternity, the verdict came through with again our ladies being on the wrong end – this time by a ridiculously small margin of 0.03 (yes, three hundredths) of a second. Enough for third but with only four boats entered no Bronze medal. With Nottingham taking the win by just 3.78 seconds this shows how close it was – maybe if the ladies hadn’t had such a hard race in the four, or with a lighter boat, a medal next time around? Although we didn’t bring home any Golds this year, the three Silvers probably represented harder earned medals. Certainly, the numbers of competitors (and clubs) seemed up on last year, with MKRC making its own contribution by bringing an impressive eleven boats. Had Steve been fit, this would have added another couple (our double and Steve in his single). Despite the foul weather (marginally better than the previous day) another hugely enjoyable day’s racing. The highlights of the day for me were those storming finishes in the ladies double, four and eight, really not knowing who was going to finish where and watching incredibly exciting side by side racing to the finish. It was just such a pity that we finished the wrong way round in them all! It was noticeable the difference in the boat park compared to the previous day – our fleet suddenly looked more at home, with Janousek being probably the most common boat, compared to the “exotic” (and expensive) boats on Saturday. Having said that, I do wonder how much faster the ladies eight would go in a lighter weight boat – watching their competitors hoist up their boats with little effort and stroll off, the struggle to lift JC out and get it to shoulders was quite galling. Oh well, maybe the Fairy Boatmother will read this and we’ll get a nice new, shiny Vespoli or something. A brilliant day again and certainly one that can only have enhanced the reputation of Milton Keynes Rowing Club! A slightly odd feeling, as we came away from Nottingham with no wins – this just shows how our expectations as a club have shifted. Being realistic though, we were stepping up a league here and banging heads with some serious competition, so the results were actually pretty damned good. We put in some very fine performances and certainly made a few people take notice of Milton Keynes Rowing Club! 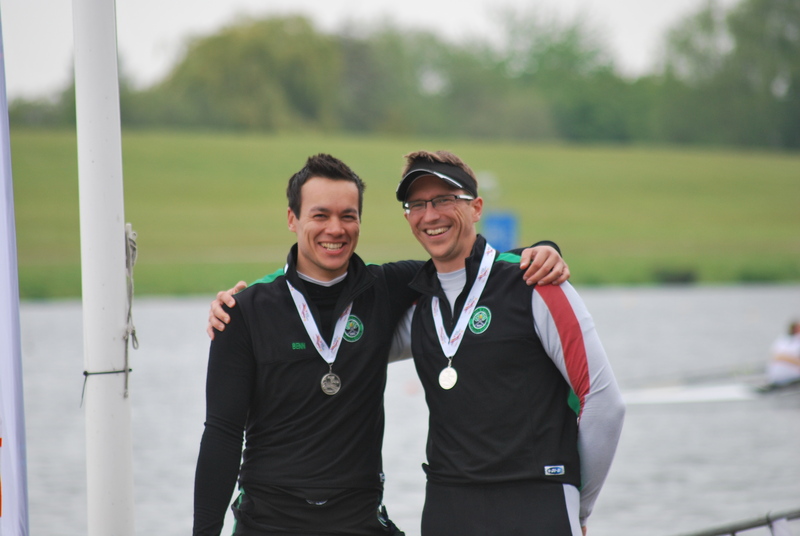 This was the first multi-lane event, first 2k race and first time at Holme Pierrepont for both Chris and Antonio, with Rob M and Nelson having only a little more experience. Considering we lined up against one university and three school crews, with just the first two crews qualifying for the final, this was going to be tough. Very tough. Throw in to the mix, the stress of trying to collect numbers (one person handing out numbers for dozens of entries) making us a bit late and nearly getting swamped on the row up (this was a recurring theme all week-end, “safety” launches creating massive wakes) and it was with a degree of nerves that we lined up on the start. On the “attention” call, the guys all came forward and set themselves. Then, on the “beep”, nothing! They’d never had a race start off of a beep, so needed a sharp shout from me of “go!” to get moving. As ever, a less than perfect start saw us dropped down behind the other four crews. However, a fast first 500m saw us ease ahead of Oundle School next to us and catch up on De Montfort University out in lane 6. Belying their relative inexperience, the guys settled well and kept up the pressure on DMU, rowing through them and hunting down Norwich School. At the 1500m mark, we had pulled well clear of the two crews behind us and reduced the gap to Norwich to around a length. Over the last sprint, Norwich then really went for it, pulling away from us and closing up on St Edwards School, but not enough to catch them, leaving St Edwards as the winners, Norwich in second and us in a very creditable third place. Not a bad result at all, especially from Antonio, who’d never raced this far (he was heard to say he was glad we didn’t have to do that again! ), especially against a school and uni boats. To get more race time and practice together, the coxless four (Mike, Benn, Tim and Josh) entered into both the Senior and IM1 events. Obviously, rowing up a level at Senior was a big challenge and so it proved in the race. Despite a good row, the other crews pulled away as was to be expected, and our guys finished in tail end place but, encouragingly, not that far off the pace. Not quite sure what happened to the draw on this race, as the ladies found themselves at the start alongside Agecroft (expected) and Durham School (not even on the draw!) but nobody else (expected two more crews)! A good start saw the ladies push clear of Durham School but fall behind Agecroft at the first 500m. They were then able to settle and maintain nearly a length over Durham over the next 500m, although Agecroft were pulling away steadily. The lack of 2k races and practices then told as Durham gradually ate into their lead and inched past them, to be fractionally up by 1500m. Despite Paula calling a couple of massive pushes over the last 500, Durham consolidated and then extended their lead, leaving Charlene, Alice, Lindy and Helen to finish third, which wasn’t enough to progress to the final. A tremendous battle for second, third and fourth positions in this race (Norwich leading comfortably throughout) saw Liz and Andi just miss out in the last few metres. With a mere 1.1 seconds covering MAA, Lea and MK, this could have gone any way but (according to the finish marshal) our pair lost it on the final stroke. Another good performance though, in a class field. This was the coxless four’s second race of the day, dropping down from the Senior category to IM1. With Bedford School, Newark and Leeds sprinting off, our boys were left in a hard tussle with Tees. Having pulled away over the first 500m and extended their lead to over 5 seconds at the 1,500m mark, Mike, Benn, Tim and Josh were looking set for fourth place. Unfortunately, this was not to be as they fell away in the last sprint, with Tees edging them out. A case of split loyalties for me in this race, with wife Paula in the Milton Keynes boat and daughter Jo in the Nottingham University crew! After another sluggish start, MK were trailing the field at the 500m mark, in contrast to the Nottingham Uni boat that had a blistering start to storm into the lead. Our ladies then pulled back and proceeded to row through Grosvenor over the next 500m, while Nottingham Uni were being hunted down by Lea, with Nottingham City chasing them hard. As they came to the final sprint, Nottingham Uni and Lea had pulled clear and were going at it hammer and tongs. With the result in doubt virtually to the line, the Uni girls clung on to record the win. MK were not far off the pace at the end, finishing in fourth, but just 12.5 seconds off of a scorching winning time – Jo saying it’s the hardest race she’s ever had! This again was a really strong performance by the Milton Keynes crew (Helen J, Charlene, Alice, Lou, Karen, Paula, Heidi and Becks, with Andi swapping sculls for a cox box) – especially rowing in the rather heavyweight JC! A very difficult race to photograph, with all the crews close and trying to get shots of two crews. 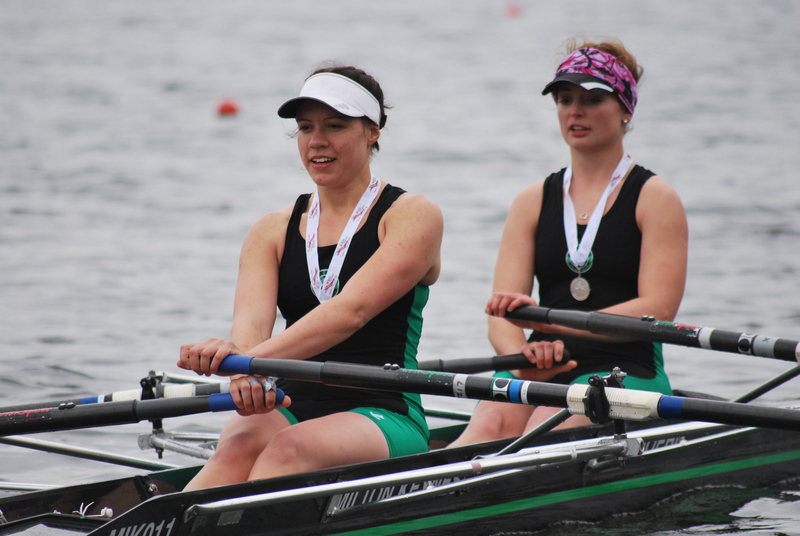 Another high quality field saw Helen M and Jenny in their first regatta together. As they are still gelling as a partnership, it wasn’t too surprising that they were a bit off the pace. This was despite putting in maximum effort – evidenced by Jenny coming out with language we really didn’t think she knew when Helen pushed the rate up at 1500m! Plenty more to come from this combination. Having established ourselves as a real force locally, this regatta gave us a chance to measure ourselves against top national crews. Despite coming away without a single win, we weren’t outclassed in any event and put in some great performances. The gulf we’re trying to span was well illustrated in the boat park; our slightly older, tattier Janouseks, Aylings and Sims looked at bit out of place amongst the gleaming new Fillippis, Empachers and Vespolis! Despite the weather (I’m still thawing out from that bitter northerly wind) it was a good event. I especially like the winners collecting their pots from the pontoon, and appreciate (from a photography point of view) the chilled attitude to allowing access to the finish area. It’s great to have the results posted up on the big board quickly and to get the 500m splits in the results. A special word too for the commentary – knowledgeable and amusing, with the occasional pithy comments thrown in, Nigel Mayglothling excelled himself (even if one of our crews were labeled as “munchkins”!). My only niggle of the day was the safety boats. All too often they were blasting up the course, causing huge wakes which were bad enough for the crews rowing up but a couple of times actually affected the racing crews coming down the course. This really isn’t on. Another excellent performance by the Ladies’ squad saw us come away from the last Head of the year with another three wins. We entered a relatively small number of crews into the event, with just eight crews out, six from the ladies’ squad and two from the men’s master’s squad. Held in what can only be described as “changeable” weather conditions, this was a good end to a very successful head season. This was a relatively new and untried (just two outings before the race) combination of Charlene, Jo, Lou and Alice with Andi coxing. Putting a relatively poor practice session behind them, the ladies came good in the race, chasing down and overtaking one of their opponents and posting a time of 7:50. This was good enough to win the category by four seconds from a strong field of Newark, UEA, CORC, Nottingham and a Rob Roy/X-Press composite. Even more encouragingly, their time put them just three seconds off the winning W.IM1 time! Steve and I had an eventful race, finishing second to Bedford in another large field, with two Oundle and one Star boats following us home. A good, solid start had seen us catching the Norwich IM3 double in front. By the time we passed Star club, we’d closed them down to a couple of lengths advantage and were overhauling them quickly. Unfortunately, they then decided to use the same arch as us at Town Bridge and cut right across our bows, forcing us to stop. Coming through the arch, we picked it up and went past them but this had cost us time. Despite some rough water heading to the suspension bridge, it really clicked after then and we finished really strongly with Steve steering a near perfect line. Our time of 7:56 was 28 seconds off the winners, so our coming together with Norwich probably didn’t make enough of a difference to the result, but very frustrating all the same. This was the first of two categories in which we had two entries, with Helen M and Amelia racing their singles. With both of them in the “B” category and with just four seconds handicap against their younger “A” rivals, it was a big ask for them. In the event, they finished third and fourth, 15 and 37 seconds respectively off the winner from Wallingford. Very nice to see both of them racing – Helen seems to have the racing bug again and good to see Amelia not only in her single again but in green and black (and having had a very rapid boat re-numbering just before the race)! The second category with two crews in saw the doubles of Andi and Liz taking on Jenny and Helen M. The two boats were good enough to take the first two positions in the category, beating boats from Peterborough, Rob Roy and Guildford. In the event, it was the “youngsters” boat of Andi and Liz who took the honours, shading it by 11 seconds. As Jenny was sculling with a suspected broken hand, sustained skiing, I’m sure there’ll be opportunities for a re-match! This looked to be a strong crew on paper, with Paula, Karen, Lou and Heidi, coxed by Liz, and it proved to be so on the water. Despite Heidi still being a novice (having done her “Learn to Row” course last summer) the power in the boat was enough to win the category convincingly. Posting a time of 8:03, they finished 35 seconds clear of the next crew, despite them having the handicap against them! The time was actually so fast, it was the leading Women’s Masters time of the day, including “A” and “B” crews. Not content with the excitement in the double, Steve had yet another eventful race, this time in a rare outing in his single. When we’d rowed up to the start in the double, we’d noticed a fairly aggressive swan halfway between the start and County Bridge. Guarding it’s nest, the bird had pecked at the blades of a couple of boats and we’d had to avoid it ourselves in the race. With his single, the bird seemed to take a particular dislike to Steve – not only pecking at him as he passed but actually chasing him down the river! This did add to his speed, so helped him to a very good third place (of nine), in a time of 8:16. It was an odd sort of day. As we were only racing from division six onwards, we only needed to get to Bedford at 1:30, so it meant that rarest of luxuries, a Sunday morning lie-in! This did lead to the surreal situation of sitting at home watching the early results coming through on Twitter, knowing we’d be racing there later in the day. It also made finding a space on Longholme Island very difficult; by the time we arrived it was chock full of cars, despite being meant for trailers only. The addition this year of the Twitter feed of results was a brilliant idea. The only down side was that by the time Tim got back from Bedford RC with the news of the ladies’ wins, they were already celebrating as they’d seen the results on Twitter! As ever, it was a nicely run event, keeping well to time and friendly. Adding an extra pontoon down on the island was another really good touch, helping spread the boating load away from the school’s boat house area. It was also a good end to the head season, with the ladies signing off with another three wins and firmly establishing them as serious competitors. All we need now is for the men’s squad to follow their example! This was our first time out at Lea and our first regatta of the season. Taking a relatively inexperienced squad and trying out a couple of new combinations, it was all the more pleasing to head home with two more wins. Held in bizarre weather, with April throwing everything at us, from warm Spring sunshine to biting winds, hail and rain, it was nice to visit a new location and race some different clubs too. This boats contained two of last year’s Learn to Row graduates (Ben and Antonio), in their first ever regatta, as well as two slightly more experienced (but still novice) rowers in Nelson and myself, with Paula coxing. We were drawn against what looked like a formidable crew from Queen Mary College for our first race. Although they were still a novice boat, they pulled one of the fastest starts I’ve ever seen and just scorched into a substantial lead – despite us getting a good, clean powerful start ourselves! For a first race together, it was pretty good, just that we were completely unmatched against a university crew (who I suspect might have done a bit of rowing at school as well) and we finished several lengths down. Enough for us to be encouraged though, but needing to compete against other club crews, not academic ones. Swapping sweep for sculls, I was out in our next event too. Racing for only the second time with Paula, we’d only had one practice session before the race as well, so weren’t sure how well this would go. In the event, we actually beat our opponents off the start but they came back at us quickly and eased into the lead. As a double, we’re still trying to overcome a definite pull to stroke side and fighting this all down the course certainly didn’t help – and led to an all too close encounter with a barge towards the end of the course! Still, we weren’t too far off the pace, especially considering we don’t do this combination very often (and Paula is far more of a sweep rower than sculler). With scarcely enough time to get her breath back, back was in the next division as well. This time she was racing with Karen in a Masters D double, sitting in for Lou. A very fine performance saw them right on the tails of the Lea crew all the way down the course, but they couldn’t quite catch them. Another very promising row and scope for seeing this combination more frequently? Tim (aka “Rubberducky”) was really quite nervous about this race, having not raced singles very often at all. He was also giving away a handicap against his opponent from Broadlands, making it even more difficult. Anyway, he really shouldn’t have worried; despite the one second handicap seeming more like five, Tim put in a superb race to row clean through the other sculler and pick up our first win of the day. We’d originally entered our ladies (all Learn to Row graduates) as a Novice 4+, but Lea were unable to field an opposing crew. What they were able to provide was a Primary crew, also recent Learn to row graduates but rowing in training boats. These were wider and more stable than the fine boats (and weighed sooooo much) and had almost an armchair for the cox. As a primary event, the crews were guaranteed two races at least – as there were just the two entries, this would be done by taking the aggregate time across two races. In the event, the two races provided some of the closest racing of the whole day; while our ladies were probably a bit more technical, the Lea ladies were younger and used to the boats. The first race saw the MKRC crew take an early lead but Lea came back at them and inched past, taking the honours in the first race by just two feet. This left our crew knowing what they had to do in the second race and, equally importantly, absolutely determined to win it back. Again, the second race saw our boat push into an early lead, putting in a really good, solid start. This opened out to a clear length lead by halfway, but Lea started hunting them down. This time though, the novice women were not going to let them past. Literally gritting their teeth, the four of them dug deeper and deeper, and did enough to hold off the fast charging Lea ladies, crossing the line just three feet up. This was enough though and it earned them the win, the overall gap being given as one foot! A really excellent first race and a great example of digging in and holding on, putting everything into the race. So, massive congratulations to Helen C, Winnie, Kelly (who found she does have a competitive streak!) and Rachael, not forgetting Karen who coxed them impeccably. Following hot on the heels of the Women’s success in the WeHORR the week before, the ladies entered a Masters “C” boat into the Vesta head. With just a couple of changes from the WEHORR boat to replace “kids” with eligible Masters it was another very strong looking crew. Starting an hour later than the HORR the previous day, and with the boat almost ready (split but still rigged) we weren’t quite so early away from Milton Keynes. In contrast to the grey overcast of Saturday, it was bright and clear as we set off, just clouding over a bit as we reached London. It definitely seemed less frenetic than in previous years and with less of a queue, the ladies were soon boated. Even by our normal standards, their boating was lightning fast and they cleared away in very short order, getting a couple of compliments from the local helpers. Jo and I then power walked down towards Hammersmith Bridge, to cheer them on and take photos. By this time, the cloud had increased and it started drizzling off and on (although not as horrid as yesterday!). Finding a convenient slipway a short distance before the bridge, we stopped and waited for the race. It’s great fun watching this race, seeing such a wide variety of abilities and ages, compared to the HORR and WEHORR, where then isn’t such a range. With everything from Masters “A” (just out of nappies) to “F” (I hope I can manage a race like this at that age) and a wide standard (from very, very good to obvious novice) it really is a great sight. After a huge gap between division two and three, the crews from 150 upwards started coming into view; our ladies were racing as crew 202. Reaching the 190’s we started keeping a sharp eye out, hoping they’d have made some progress through the field. Sure enough, we then saw the familiar green blades come round the corner as they came tanking down the river – passing us, they were a couple of crews up and in the process of storming past another. Obviously, they were gong extremely well and making good progress up the ranks – and looking pretty damned good into the bargain! Another long walk back to Barnes Bridge, keeping an eye out for the ladies, but we were back in plenty of time. It then seemed an eternity before the came back into view and we went and helped them in. As with the WEHORR boat, they were really elated, feeling the race had gone very well, overtaking six crew in all. On the drive back, Paula was continually refreshing the results page on her ‘phone until finally the times were up. In an astonishing race, they finished a stunning third in Women Master’s C and (age adjusted) a hugely impressive 11th overall. This was just the latest in a string of wonderful performances from the ladies squad, who are really putting MKRC on the map. OK, prize of the day goes to the Vesta Women. We were watching the race when a Vesta ladies boat came into sight – they all seemed to have something in their hair but we couldn’t quite make it out. As they got closer, it was obvious that they all had feathers in their hair, warpaint on their faces and the cox was wearing a huge Indian headdress. This was very funny but better still, about five crews back came the second boats – you’ve guessed it, the Cowboys! False moustaches, check shirts and Stetsons, with the cox trailing an inflatable cactus. Absolutely brilliant, well done to them all for raising a real laugh on the day. A big thank-you to Steve as well, he and a guy from Reading RC did a sterling job helping all of the returning crews land and de-boat. Finally, very nice to be rigging the boat and see someone else in an MKRC splash top – this was none other than one of the founders of the club, Jim Flood, racing for Reading. Checking back, it looks like six years since we last had a boat entered in the Eight’s Head, so it was very pleasing to be able to pull together a crew for this year’s event. With most of the crew being available for a few weeks before, we’d also been able to get in a few practice rows. These had had mixed results, varying from very good to very poor (and very, very wet at Northampton the Sunday it rained non-stop for three hours). Against this, and that we were rowing IM2 despite having four novice rowers in the boat, we weren’t really sure what to expect. Returning to Civil Service to boat (having gone from Barn Elms the previous week) we got down to London in plenty of time, our new, aerodynamically shaped trailer (courtesy of a close encounter with a low barrier – oops) attracting some attention. We were actually rigged early enough that there was some discussion as to whether to get out for a quick paddle before boating time, but in the end, we decided this would be a bit tight. Come the due time, we joined the queue for boating and without too much delay got waterborne just after ten. After an uneventful paddle upstream, we pulled over to our marshalling station virtually opposite the finish post for the Boat Race. We’d got quite a while to kill and with the stream getting quicker this led to the usual fun trying to keep on station. In our case, this meant the poor bow man (me!) rowing more or less continually to stop us drifting off down stream. Still, a good way to keep warm on what was a pretty dull, cold day, punctuated with the odd intermittent shower. After what seemed an eternity, the first boats burst through Chiswick bridge and set off down the course; it was then our turn to shuffle up stream, past Putney Town RC and virtually to Kew Bridge. Finally, it was our turn to strip down to racing kit and spin. Liz, coxing, manoeuvred us beautifully into the stream and we set off towards the start line. Building as we approached Chiswick Bridge, we shot through the arch and got the “go” call. We were off. Pretty soon, we had the crew behind us (Pembroke College Oxford) on our tail and pushing to get past. Not surprising as their average age was probably half of ours and they’d started very close behind us, but a bit demoralising. Still, this was offset by encouraging calls from Liz that we were closing on Marlow in front of us. With us still chasing them, we were gradually caught by a succession of crews, but kept pushing along. The boat was running reasonably well but we’d never quite ironed out the sudden dip to bow-side just at the catch. Just before Hammersmith Bridge, this was nearly very costly as I got caught going in off square and the blade whipped away and down from me. Fortunately, I was able to control it before it became a full-blown crab – in fact, no-one else noticed! Off the bridge, Benn called a push and this was easily the best part of the race – the boat really lifted and we could feel the surge in power and improved run. This seemed to make the run past Fulham FC go incredibly quickly and we were soon across the finish line. With a lot of traffic building up past Putney, we were told to pull the equivalent of a handbrake turn and head back up river. It’s such a long paddle back, although nowhere near as far, it seems, in an eight compared to a four. With two of us dropping out at a time to re-kit (and stuff a most welcome Mars Bar) we kept moving and were fairly soon back to the crossing point at Chiswick Steps, before returning to our boating area. All things considered, not a bad return to the HORR. Given the very mixed ability in the boat and the wide spread of ages, it would have been a miracle had we finished anywhere near the top half. In the event, we came in 337th overall (of 394) and 69th of 74 in IM2. Must have been the grey weather but the marshalling wasn’t as chilled as in all the recent races on the Tideway. Despite an almost complete absence of the normal idiocy from crews, they were definitely grumpy – mind you, I probably would be too, stuck in a launch for hours in the cold and rain! From a personal point of view, it’s nice to be able to say I’ve raced in the HORR but I think this will be the first and last time. Rowing isn’t my strong point, being far more of a sculler, and racing with a crew where the stern four are all about a foot taller exacerbates how short my stroke is! So, I think I’ll stick to the fours head and, if we can rustle up enough “oldies”, the Masters Head in future. Anyhow, thanks to the rest of the guys (Benn, Mike, Josh, Pierre-Yves, Nelson, Chris and Steve) plus the excellent Liz for coxing, for carrying me down the Thames! Following on from the highly encouraging performance at Trent Head, the ladies eight headed down to London for the annual Women’s Eights Head of the River Race (WEHORR). Despite the grey, overcast and chilly weather, the winds were quite light and the Thames looked as flat as I’ve seen it, so it looked all set for a good race. In the event, the MKRC ladies not only beat expectations but simply hammered them into the ground! With a target of aiming for a top 100 finish (out of nearly 300 crews) they simply flew down the course and posted a time of 22:08.65 to finish a stunning 76th overall. Looking more closely at this, the time put them as the second fastest Eastern Region crew (only a Broxbourne IM1 boat being quicker) and the sixth fastest IM2 club crew; considering this is an international class event, this has to be one of the club’s best ever performances. Having done the Head of the Trent the week before, we went down to London a lot more relaxed than usual, knowing that we were well capable to finishing the course strongly. We were boating from Barn Elms, which is just down the river from Putney. This was the first time we had ever boated from there and we learnt a big lesson from the start. Having put the eight together, complete with riggers, on one side of a fence, there was only a small gate in which to get the eight through, this also involved mountaineering up a muddy bank and then almost putting a couple of your crew in the Thames before there was room to turn the boat – lesson learnt, we de-rigged and split the boat BEFORE coming through the gate on the way back. The advantage of boating at the Putney end is that you get a nice warm-up rowing to the start. This was a good chance for us to try to gel as a crew as it was the first time we had all been together thanks to Mother Nature keeping the lake frozen for a couple of weeks. Going off at number 134 meant that we didn’t have the long wait that we usually have on the Tideway and it seemed that no sooner had we got to the marshalling area, that we were moving down the river and were soon being told to get into racing kit. We were very quickly spinning (for which Andi was complimented by one of the marshalls) and then we were off. Andi pushed us from the very start to beyond the end!!! Helen wanted to overtake at least one crew – in the event, we very quickly took one crew and then another, we lost count in the end (think it was about 5 or 6). The race was long and hard (what race isn’t?) but very quickly Andi was giving us the final 20 push. Only a short row back to Barn Elms, and my day was made when I saw Tim grinning like a Cheshire cat on the towpath. After getting the boat out and de-rigging we all then went to buy a tee-shirt and replenish the caffeine levels at Costa whilst we waited for the provisional results. The results were finally posted and we were provisionally 76th. We had gone into the race hoping to be in the top 100 and we had done that with style!! !.